With the newly minted leader of the Catholic Church choosing to name himself after Saint Francis of Assisi, this book could be perfect if you have kids with questions. The biographical part here covers the basics of Francis’ life, without dumbing it down for children. We hear how Francis was born to a wealthy merchant, his early embracing of poverty, and various spiritual transformations along his path. Naturally, we are there when Francis preaches to the birds, as well as when he worries over his ministry. In the end, this small biography paints Saint Francis as one who literally embraced the poor and sick, who gave up material things because that’s what Jesus did. The illustrations in this slender volume are beautiful. They are simple, with delightful images of Francis and animals alike, but nothing lapses into cartoonery: like the prose, the art never assumes children can only understand things that treat them as idiots. I think most children can handle a short break from Timon and Pumbaa. 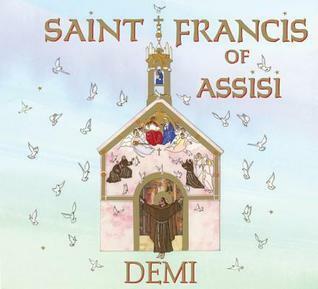 All told, Demi’s “Saint Francis of Assisi” is a small, lovely book to be cherished and shared, and it shares a story as relevant today as it was 800 years ago during Saint Francis’ time. This entry was posted in Books, Children, Memoir or Biography, Religion/Spirituality and tagged booksandmoviesandcrap.com, Demi, Saint Francis of Assisi. Bookmark the permalink.